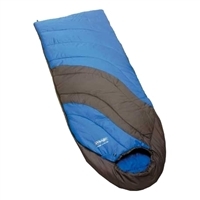 The Adventure Mat will give warmth and superior outdoor comfort at the end of a long day. Easily inflated, it will provide an ideal sleep solution instantly. When weight isn’t an issue and a touch of luxury is important, this soft and comfortable mat with built in pillow is the obvious choice. Unrivalled comfort and convenience,7.5cm of optimised insulation, soft-touch flocked finish on the top-side, durable non-slip base. Unrivalled comfort and convenience,10cm of optimised insulation, soft-touch flocked finish on the top-side, durable non-slip base. The Spey is an easy to pitch two-pole tunnel tent, featuring Vango's innovative Gothic Arch poles. A 3-pole tunnel tent, generous sleeping space combined with a large, functional porch area, TBS®II (Tension Band System) to provide unrivalled stability in stormy conditions. Minor blemish on floor. A semi geodesic tent with a dual entry flysheet. Perfect tent for Scout campers and semi-technical users that are on a strict budget.